270 Hiking Days, Over 2,175 Miles -- and 95 Flip-Flops Robert A. Callaway learned about the Appalachian Trail when he was eight years old, while listening to his mother talk about how his grandfather had always wanted to hike it. That was in 1953, and it would be fifty-five years before Robert followed his grandfather's dream of thru-hiking the trail. In 2008, after he'd done much group cycling and taken a few test hikes in previous years, sixty-three-year-old Robert and his reluctant, late-fifties brother Tommy, both retired, set off to hike the trail in its entirety. Their trail names, assigned to them by a pair of younger and faster hikers at Fontana, were Slow (Tommy) and Steady (Robert). Using an old Buick and an Isuzu pickup, Robert and Tommy flip-flopped their way along the trail, taking rest days when tired or injured and enjoying Tommy's cabin in Georgia while on the southern part of the trail. They gained speed and stamina as they developed their 'trail legs,' but Tommy was still slow, lonely for his family and rapidly losing enthusiasm. Tommy dropped off the trail after 300 miles, leaving Robert to continue on by himself, and he worried that introverted Robert would not fare well alone. But 'Steady' Robert persevered and completed the entire hike and, despite Tommy's concerns, made many friends and did well along the way. 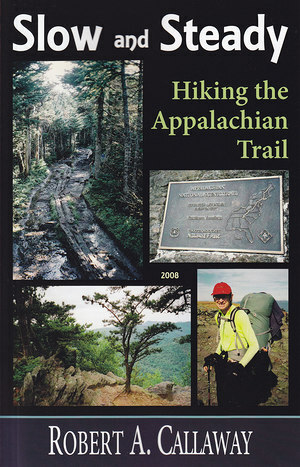 Slow and Steady: Hiking the Appalachian Trail is Robert's account of the journey, and it details the vehicle and hiking flip-flop sites and strategies, zero-day locations, eateries and accommodations, injuries and equipment failures, memorable trail details, camp adventures, characters encountered, and more, along the fourteen-state historic trail. It's an excellent starting book for older and especially introverted readers who want to do the trail but who also want ready access back into civilization to wash up, rest and eat real food when needed. Complete with photos.